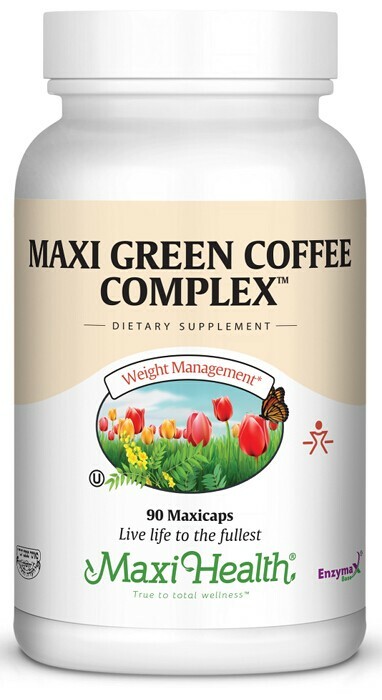 If your idea of an ideal kosher weight loss formula contains green coffee bean extract, could you image if it had kosher green tea extract too Well, Maxi Green Coffee Complex™ has both. With Maxi Green Coffee Complex, you get green coffee bead extract with 50% chlorogenic acids, and green tea extract standardized to 98% polyphenols. Try Maxi Green Coffee Complex™ today. Take one (1) or two (2) Maxicaps™ before meals, twice daily, or as directed. Vegetable cellulose (capsule), vegetable magnesium stearate, silicon dioxide, Enzymax® ( calcium carbonate, bromelain, papain, lipase, amylase, protease, silica), and microcrystalline cellulose. This product contains no animal products, soy, wheat, gluten, yeast, salt, sugar, milk, artificial flavors, colorings or preservatives.